About 500 km (300 miles) south-west of Costa Rica, in the Pacific Ocean, at 5 degrees north latitude, we find the Cocos Island, protected in a national park and belonging to the province of Puntarenas. Here the climate is equatorial, hot and humid all year round, with a (relatively) dry season from January to March, and a rainy season from April to December, even though showers and thunderstorms can develop year round. Given the abundance of rainfall, the territory, occupied by hills that reach up to 500 meters (1,650 feet) above sea level, is covered by rainforests, and there are streams that generate waterfalls. The rains occur mainly in the form of downpours and thunderstorms in the afternoon. The temperatures are high but without excesses, and stable throughout the year, with a slightly warmer period February to April. However, the heat is tempered by sea breezes. Here are the average temperatures. As mentioned, precipitation is decidedly abundant, in fact it exceedes 5,000 millimeters (195 inches) per year. There is no dry month; however, the rains decrease in intensity and frequency from January to March, with an absolute minimum in February. In the rainy season, especially from May to October, the rains occur almost daily. Here is the average rainfall (there are no official data, and the data refer to studies carried out over a period of a few years). There are no official data about the amount of sunshine, which, however, is not very good because of the frequent rains, and in any case, it is better in the less rainy months. The sea at this latitude is warm enough to swim in all year round. 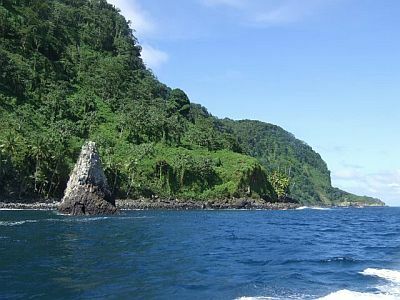 The best period to visit the Cocos Island is the least rainy one, which goes from January to March, and in particular the month of February. Since the sea tends to be calmer and visibility is better, the dry season can be preferable for scuba diving. The rain can make it more difficult to get around; moreover, during the rainy season the visibility is slightly reduced by vertical currents, which bring the plankton upwards, and there can be thermocline conditions (i.e. layers in which the sea is cold); it is also true that in this period the animals to be observed like hammerhead sharks and manta rays should be more numerous.